The Ohio State men’s hockey team is dancing for the third consecutive year, entering the NCAA tournament as the No. 3 seed in the West Region. The Buckeyes finished the season with a 20-10-5 record overall and went 13-7-4 in conference play to finish atop the Big Ten standings for the first time in program history. 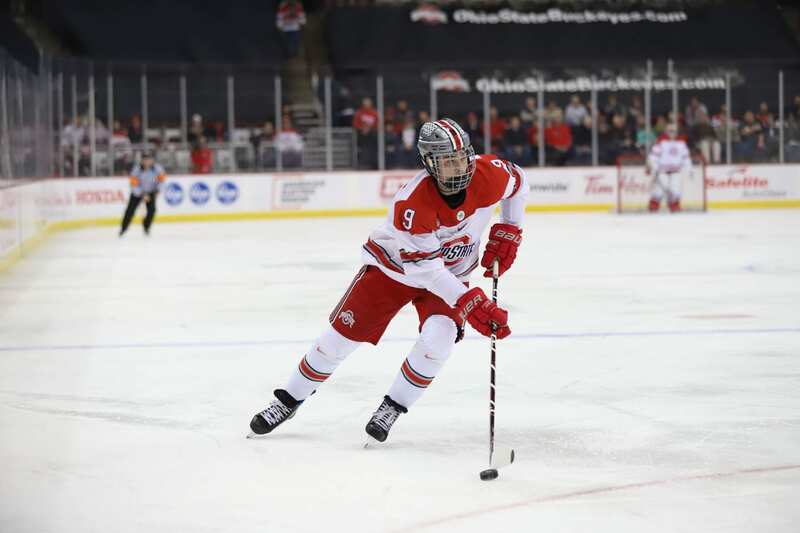 While the roster contains a large supply of experience, with 21 players returning from the previous season’s Frozen Four team, momentum is something Ohio State doesn’t have on its side heading into the tournament. The first half of the season went smoothly for the Buckeyes, who fought to an 11-4-3 record with three of their four losses coming against fellow tournament teams in Massachusetts, Bowling Green and Notre Dame. Ohio State scored 49 goals and only allowed 37 goals in the first half and looked primed to return to the tournament as a No. 1 seed with its veteran squad leading the way. Late in the season, however, things began to go off the rails. After ripping off a seven-game winning streak stretching over four series, Ohio State lost five of its last seven games of the regular season, including a 5-1 loss at home to Penn State in the Buckeyes’ opening round of the Big Ten tournament. Part of the reason the Buckeyes struggled in the second half was due to its goaltending decline. The duo of redshirt senior Sean Romeo and sophomore Tommy Nappier had an incredible start to the season, including five shutouts and a combined goals allowed average of only 2.05 on 37 goals allowed. In the final 16 games, however, they allowed 44 goals, and their combined goals against average fell to 2.58. Though the Buckeyes may not be the hottest team heading into the tournament, they can still count on the consistent play of their veterans to help lead them. Senior forward Mason Jobst led the team this season with 17 goals, 36 points and 8 power play goals, while junior forward Tanner Laczynski had a team-high 20 assists. Ohio State will take on Denver at 4 p.m. Friday in Fargo, North Dakota.